Dr. Ferullo is dedicated to giving his patients the best care possible. That is why this St. Pete Dentist is screening for oral cancer with the newest enhanced oral assessment system, VELscope®. This new technology allows Dr. Ferullo to screen for pre-cancers, cancers, and other diseases. The VELscope®. System allows enhanced visualization which can lead to early detection of any tissue abnormalities. Over 36,000 Americans are diagnosed with oral cancer each year. Oral Cancer receives less publicity than other cancers but claims more victims than cervical, skin or testicular cancer. Early detection and treatment significantly reduces the need for radical surgeries or disfigurement and saves lives. Dr. Ferullo is a St. Pete dentist that wants to make sure his patients get this essential screening regularly. He feels that regular oral cancer screenings are an important part of the lifetime partnership he forms to ensure his patients can achieve optimum dental and overall health. 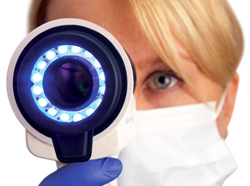 Unlike other oral cancer screening techniques, VELscope® uses tissue fluorescence and does not require the use of dyes or extended testing procedures. In fact, Dr. Ferullo can perform these in normal lighting during routine hygiene exams in around two minutes. This very important screening in the fight against oral cancer is quick and easy while giving you peace of mind. Dr. Ferullo’s dental office is proud to always offer the newest technology available in dentistry. This includes laser dentistry which is an alternative to scary needles and drills. Our gentle dental care approach reduces pain and recovery time with many dental procedures so you do not have to be anxious about your visits. Adding the ease and accuracy of VELscope® oral cancer screenings to his practice is just another example of his commitment to offering his patients the most modern techniques with your well-being in mind with the least amount of time and inconvenience to you. Our office has been forming Lifetime Partnerships with patients for over 25 years. Many have been patients of Dr. Ferullo for decades. He is a St. Pete Dentist that believes in giving his patients that best care possible for their dental and overall health. Call our office today at 727-822-8101 to get started on your lifetime partnership for your dental and overall health today.